Do you accept every LinkedIn connection requests that comes your way? This is a guest post by Mildred Talabi. For the past eight months or so I have been getting LinkedIn connection requests on almost a daily basis – some from people I know, but the majority from loosely connected or total strangers. Recently, this one-a-day average shot up dramatically to around five or six requests a day (I still haven’t figured out why) and just as I did with all the others, I accepted, accepted, and accepted, and now my LinkedIn account has so many connections that even LinkedIn can’t be bothered to count them and just simply tells me there are “over 500”. Well, up until last week I would have agreed with you wholeheartedly. You see, big time networking was my goal and my reason for signing up to LinkedIn four years ago. I wanted to connect with people on a professional level, in a way I couldn’t do on Facebook with all that ‘poking’ and wall posting going on. Initially I adhered to LinkedIn’s strict warnings to only connect with people I knew personally in some shape or form and rejected all invitations that didn’t fall into the colleague, classmate, friend or “we’ve done business together” categories. This method served me well for the first few years and allowed me to build up a healthy network of over 300 quality connections. And then my boundaries started to slip. I let in one or two oddballs here and there (after all, if I was going to extend my chances of networking effectively, wouldn’t it make more sense to network with people I didn’t already know?). The one or two later turned to four or five and then gradually I found myself blindly accepting every request that came through – desperate job seeker hoping for a lucky employment break through my connections…yes; random technical engineer from some remote part of the world I’ve never even heard of…yes; African Masters PhD university student looking for a British wife…huh, what? Yes, go on then. This vicious circle would probably have carried on had the wise words of David McQueen not re-entered my living room and slapped me on both cheeks while I sat facing yet another LinkedIn request on my computer screen last week. At the time I thought, that’s very brave and focused of you David, but I totally dig having an overly large network – I mean, you never know when you’re going to need to call on the services of that hairdresser in Texas you’ve just connected with, or that acupuncturist looking to expand his practice in your local area. But I was wrong. I now understand what David meant by “mutually beneficial relationships” and of late, my LinkedIn account hasn’t been contributing to any kind of quality relationships, let alone mutually beneficial ones! Each connection you make has the potential to be a future stepping stone to your choice career; the more connections you have, the greater the probability of this coming to pass. You open yourself up to spammers who flood your inbox with generic marketing messages and invites to events you have not the slightest bit of interest in attending (“annoying” does not even begin to describe this). Ultimately I’ve found that LinkedIn is at its most powerful for job search purposes when your connections reflect your real life relationships – the more meaningful your connections, the better the chance that those people will vouch for you when you're looking to connect with potential employers in their network. They are also far more likely to pass on job leads to you than people you don’t know at all but have connected with on LinkedIn anyway. So with all that said, as of this day I’m making a commitment to no longer accept random LinkedIn requests from strangers and if you’re job-hunting at the moment, I would recommend that you too make the same commitment because then, and only then, will you be able to truly experience the great benefits of online networking via LinkedIn. Mildred Talabi is the founder of CV Makeover Expert.com and the author of 7 Keys to a Winning CV: How to create a CV that gets results. Mildred trained as a journalist and worked for various publications, including The Guardian newspaper, before “accidentally” embarking on a career in CV and career advice. Today she spends most of her time delivering career talks, seminars and workshops to students and graduates, and writing a weekly blog on career issues and job hunting tips and techniques which you can find on her website www.mildredtalabi.com. If you want Mildred Talabi to win, share this article with your friends. READ NOW: Why LinkedIn Recommendations Really Are Valuable. 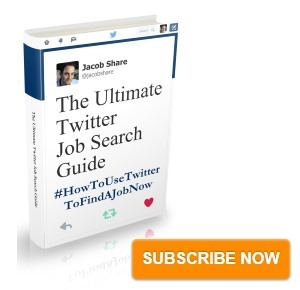 Subscribe to JobMob via RSS or email and follow me on Twitter for more ways to use LinkedIn on your job search. These are great points, and many LinkedIn users eventually reach the same conclusions Mildred has. Here’s what I think: you should have a connection strategy. 1) If you are a LinkedIn Open Networker [LION] all the way, eventually it will pay for you. 2) If you consistently connect only with people you know well, you will be able to leverage LinkedIn tremendously [a lot more in my eyes than LIONs]. 3) Yet most people do NOT choose a connection strategy, nor even think they should pick one. They end up reacting to invitations, accepting some, ignoring others, not even knowing the other options [replying, reporting…]. Isn’t it up to you to make those relationships mutually beneficial? Who’s fault is it really, that you haven’t contacted half of your LinkedIn contacts in months? I think a review should mean getting back in touch. Great article. This dilemma is something that we all face with social media and deserves the attention you give it. You will always attract people because of the quality service you offer, so scheduling a quarterly purge is just the thing. Just go through contacts a -z and ask yourself “help me or hinder me?” If they don’t help, then hit the delete button. Thanks for raising our awareness. Hi Daniel, thank you for your comment and further reading – I do agree with you, it’s definitely all about having a strategy of some sort and reviewing that regularly to make sure it’s still working as it should. Which leads me to your comment Clement – you’re totally right, I take full responsibility for not being in touch with my contacts as regularly as I would have liked, but that’s part of my point – the larger my network grew, the harder it was for me to manage this! Maybe some of us still remember pre-mobile phones the need to actually remember phone numbers and some of us can still remember about 20 numbers of your friends’ (now their current parents home line). Pre-pre-smartphone, many people had to decide which contacts to keep in your memory because the sime filled up fast and the mobile internal memory was also limited. With smart phones, you no longer need to remember actual numbers and you can save the contact details of an endless amount of people. At a certain point though, this advantage slows down your efficiency when trying to find a number. With social media you can be connected to an endless amount of people but how many can you really stay in contact with? Clement’s question is legitimate yet how much time is needed to maintain your personal network and at what point does this become a distraction? I identify with Mildred’s post though. I’m for quality over quantity. Great points to note in this read, real business is about good relationships. Love your writing style, Mildred! I agree, it’s a healthy thing to review your business connections every now and again. It raises a wider issue of information overload which, of course, is really about poor self-management. We just need to filter better, and that’s a message I take away. Great article Mildred! I did the same with my Facebook account about a month ago due to information overload from people I’ve never met! And not long ago I started rejecting LinkedIn requests too (and I’m not in the over 500 crowd) because quantity is not as important as quality. My current strategy when receiving requests from people I’ve never met is to review their profile to determine why they want to connect with me and whether or not it would be beneficial for both of us. Not long ago one of them turned out to be a missionary attempting to infiltrate via a variety of Jewish groups on LinkedIn – I reported her to the group managers. It’s VERY important, IMHO, for group owners/managers to check out new members before giving them access to a group that could be targeted for SPAM or worse. Thank you for all the great comments guys; I think we have a general consensus that filtering and evaluating connections – whether on LinkedIn or elsewhere – is necessary for building and maintaining good professional relationships! I am a fairly open networker (part of my strategy). 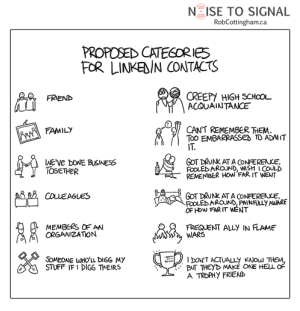 As one of the early LinkedIn adapters, I used to only get requests from folks who had legitimate reasons to connect to me – and would explain why they wanted to connect. As a resume writer, I generate business from LinkedIn when people connect, so it has been part of my business model. However, recently, the number of requests has increased – and some have been with fake profiles – and for awhile I got several requests from escorts in Russia. I have reported several fake profiles to LinkedIn and now check every profile of a person who tries to connect with me. If they do not list their purpose for connecting, I send a simple note to ask their reasons, along with an invitation to send me their resume and job goals, if that is their reason for connection. I do not enter people in my network unless I know them or they can clearly articulate the reason they want to connect. Terrific article. I often receive connection requests from people I don’t know and routinely ignore them. Especially the ones that have the standard “I’d like to add you to my professional network” message. How lame – if they can’t be bothered to customize the request, introducing themselves and telling me why they want to connect, then I don’t waste my time. I advise students that it is the QUALITY of their network, not the QUANTITY that counts and will ultimately benefit them in their job search and/or professional development. I agree with your premise. When I get random requests, I try to engage in some sort of dialogue such as, “How did you find me?” I know users who have at least a phone conversation upon accepting his or her invite. Numbers don’t impress me unless they are actual relationships that are being cultivated (not necessarily in person). Mildred, this is an excellent blog! I am in complete agreement with you because ultimately, mere connectedness on LI an authentic relationship. Great article! I was actually reviewing my LinkedIn profile the other day and I realized that I have quite a few “contacts” that don’t benefit me at all – people I don’t know, people I haven’t spoken to in years, family members that never use LinkedIn, and so on. I merely accepted these invitations to build my network. However, you make some good points on why “weeding out” these types of connections is crucial. Thanks! Interesting article, but it misses the point. 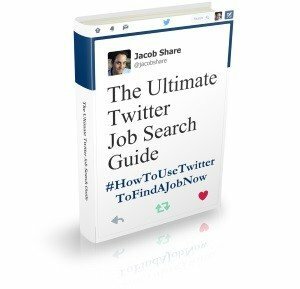 LinkedIn is the worlds most public CV database and increased job opportunities through a wider network is not mutually exclusive to keeping in touch with your preferred contacts. Sure avoid the African Princes looking for love, but keeping your network wide can only benefit your chances of a new job, without denting your ability to get business opps from your existing contacts. Mildred as usual talks with a great deal of straight to the point, no beating around the bush common sense. The beauty of Linked-in for newbies is that it encourages you to go for broke getting as many people as possible to connect with – the more the merrier and a sense of ‘pride’ almost for how you can make those numbers grow. However, being selective in who you allow into your ‘inner-circle’ requires a level of self discipline and the need to adopt an approach that only the very best will get the nod from me to join my ‘exclusive’ list. That level of discipline pays dividends 12 months later when you only need a pruning exercise rather than to get the chainsaw out to your unwieldy list. My maxim is quality rather than quantity as they say. You do have very valuable points. I personally do not accept everybody and as a LinkedIn Trainer for business owners, I would not recommend that everyone has to be accepted. I do communicate with all of my connections by inviting them for us to meet offline because that is the main purpose of this platform. Some reply, some don’t. I find that the ones who don’t reply are the ones who send lots of marketing messages. At the same time because I do not accept everyone I do have less marketing messages. Finally I would say that LinkedIn is a great platform and one has to focus in building valuable connections. Thanks for the new comments everyone – it’s great to have so many perspectives on the issue and I’ve learnt a few new things also! I agree with not accepting requests from people you have never interacted with, who send a generic request. LinkedIn is about staying in contact with people who are already in my business network. Ideally there is mutual benefit, but I am very open to connecting with workshop participants or students because I know my connections may be of benefit to people in job search mode. One of the saddest things on LinkedIn is getting a request from someone who hides their Connections. They want benefit without reciprocity. My pet peeve is accepting a request from someone who “has 22 mutual connections” and the first thing they do after connecting is send me a sales pitch. I remove that connection right away. The pros you mention are too great to ignore. 1. You’re more visible. So other people can find you. 2. There’s greater potential to find people you need.